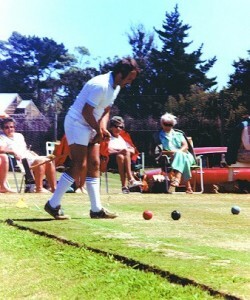 John Prince commenced playing Croquet at the NaeNae Croquet Club situated in the Lower Hutt Hospital grounds in 1959 by sheer chance. As a 14 year old schoolboy he had seen the game being played from the local swimming baths that overlooked the Lower Hutt Croquet Club in Riddiford Gardens. He was intrigued and upon borrowing “Croquet Today” by Maurice Reckitt from the local library became more fascinated. He visited the NaeNae Club near his home and was fortunate to be invited to have a game by members Melba Miller and Muriel Palmer. Shortly after Ashley Heenan was approached and agreed to coach John. His career literally took off, at aged 17 with practically no tournament experience he made a late debut into the New Zealand MacRobertson Shield Team, after winning his singles and doubles matches for a North Island team against the Australian visitors. He caused something of a sensation during the third Test Match England v New Zealand, when he defeated John Solomon, universally regarded as the best player in the world. John went on to reach the semi-finals of the NZ Open Singles where Solomon got his revenge, but young Prince won his first National title when he took out the NZ Men’s Singles, defeating amongst others English test players H.O.Hicks in the semis and Bryan Lloyd-Pratt in the final. Over the following years John amassed an impressive number of national titles, including the NZ Open 8 times, NZ Doubles 11 times, NZ Men’s 9 times, and Best “10” or “8” 8 times. He was also involved in attempts to publicize Croquet, including an early television demonstration in the days of black and white TV! He wrote several newspaper articles about the national Croquet scene along with contributions from Arthur Ross. In 1969 he was Captain of the N.Z. MacRobertson Shield for the first time, going on to Captain his country five times, including two series wins in 1979 and 1986. He has set 3 MacRobertson World records by being the youngest player to compete, by playing in 9 MacRobertson series and became the first player to play 100 matches. On 30 March 1970 at Hastings during the final of the Hawkes Bay Easter Invitation John became the first player to complete a sextuple peel in a competition. John served on the New Zealand Croquet Council for a number of years, being involved especially with International and domestic selection, International matters, and tournament formats and conditions. He provided illustrations for the CNZ publications “Approaching Croquet”, and later wrote and illustrated “Practice with a Purpose”, followed by a set of supplementary booklets. Always keen to see younger players and those who work given as much opportunity to compete he ensured the major events in Council tournaments were played over weekends wherever possible. Winning the MacRobertson Shield was always number one priority with John and he provided encouragement and support to many up and coming New Zealand players as he was constantly on the lookout for potential team members. His most significant contribution in this regard was his recent skilful mentoring of a very shy youngster Paddy Chapman, now one of New Zealand’s top ranked players. He has always led by example and sets very high standards for himself and others. Due to his drive and determination NZ croquet has been able to be the best playing nation over some of those years mentioned above. John is in every sense a true sport and has always been regarded highly by all players around the world. He is recognised as an authority on the game and has played a major part in the development of croquet world-wide and was a member of the World Croquet Federation Management Committee 1997 – 2003. He is a great NZ sportsman and has been an excellent ambassador for his country over all these years. He is a caring person, neat, meticulous, helpful and generous. John is the one person that the croquet players try to copy in both attitude and skill level. His playing record has set the standard in the sport in New Zealand. He has been recognised in New Zealand by being awarded the Governmental honour of “Member of the New Zealand Order of Merit – Service to Sport”. He is also a Life Member of his club, association and of the New Zealand Croquet Council. He was also awarded an honorary life membership of the Croquet Association (of England). John is married to Sue with two adult sons, Nicholas and Jonathan. He worked part-time for both the Bank of New Zealand at Christchurch International Airport; and the Male Survivors of Sexual Abuse Trust as an Administration Assistant and Advocate. He has now retired and lives in Waipukurau in the Hawkes Bay.